In 646, Prefect Gregory declared his independence from the Byzantine Empire and took control over what is modern Tunisia, using the established name, Numidia. He declared himself emperor and made Sbeïtla, or Sufetula, as it was known then, his capital. The backdrop of this was the threat from the east, the forces of the Arab Muslims which had gradually been closing up on his Christian lands. In 642, Tripoli had been besieged by the Muslims. He wouldn’t stay in power for even a year. In 647 his troops were severely defeated, and Gregory was killed. Although the Arabs left Tunisia alone for more than 20 years, this marks the beginning of the end of Christian Tunisia. Sbeitla’s history stretches back into Numidian times in the 1st millennium BCE. There is little we know about its history, except that it became a rich city due to the olives grown in this region. Its greatest wealth was achieved in the 2nd and 3rd centuries CE. It is from this period that we find most of the impressive buildings that have survived until our times. Many of Sbeitla’s structures have survived well. The forum, a mosaic bath tub, Diocletian’s Arch and the street layout are among the finest of their kinds in Tunisia. Sbeitla’s forum is the most impressive part of the entire site, with its three almost intact temples in the centre. The Temple of Minerva is in the best condition, while the Temple of Jupiter next to it has almost all of its walls still standing. The Temple of Juno has fared worse, but there is plenty to help you imagine what it must have looked in pristine condition. Only surpassed by the amphitheatre in El Jem, the forum of Sbeïtla is the most imposing and impressive Roman structure in all of Tunisia. To the south of the forum is the Arch of Antionius Pius, creating a nice photo opportunity for photographers of all ranks. Note that the Temple of Jupiter, in the middle, was only accessible from the side, while the two flank temples have stairs in front. The southernmost of the three temples was dedicated to Minerva, which was the daughter of the two gods revered in the other two temples. She was considered to be the virgin goddess of warriors, poetry, medicine, wisdom, commerce, crafts and inventor of music. Her temple appears as the most impressive of the three from the outside, and even the interior is in excellent condition. Still it will probably disappoint anyone with experience from Egyptian temples with its simplicity of the interior. The niche in the middle had a statue of the goddess, of which the head is displayed in the museum. The Temple of Jupiter stands in the middle, being the temple of the most important of all gods in the Roman pantheon. It is the largest temple, and deduced from its present, excellent condition, it was the object of first-class engineering. It is noteworthy that the temple has no entrance by itself, it was entered by bridges across arches from either of the other two temples. As it stands now, the most interesting detail to take in for those climbing the Capitol, are the underground chambers which cannot be entered, but viewed from above. Jupiter’s temple has no niche for the god statue. Still there must have been one, probably placed in the middle of the floor. Note the recesses for the roof beams. Arches connecting the Temple of Jupiter with the Temple of Minerva. While the bridge is gone here, it is still intact on the other side, towards the Temple of Juno. The Temple of Juno is by far the least impressive of the three making up the Capitol. It is also the most ruined one. Juno was the Queen of the gods, the wife of Jupiter and the mother of Minerva. The niche in the middle had a statue of the goddess, which has never been found. The arch leading into the open courtyard of the Forum with its three openings, was built in 139 CE, according to an inscription on the entrance archway. It is clearly among the finest arches of any site in Tunisia, and adds a dramatic effect to the arrival to the Forum. Note that it was never finished, to which the rough surface of the four columns in front testifies. Sbeitla has a selection of fine baths, some small and rather private in nature. The most impressive are the Great Baths, where large mosaic floors have survived almost intact from the original state. The Great Baths cover an area of 100 times 50 metres, and dates back to the 3rd century CE. The two main sections are the cold baths and the warm baths which is interesting for its under-floor heating system. Connected to the baths are also the sporting grounds known as Palaestra (top picture). The Palaestra is noted for its fine floor mosaics surrounded by a double colonnade. This structure lies just west of the churches, and is completely unmarked. Nor have I been able to find any information about it from any guides. It looks like some sort of bath or even a laundry, or it may be a factory of some sort. In one of the rooms 4 small basins stands next to one another. The whole structure is quite small. The baptistry basin of the Basilica of St Vitalis is quite important to get in on your visit to Sbeïtla. Its shape is quite beautiful, so are also the details. It may however be overlooked, as it is set in a separate chamber behind the apse of the church. It dates back to the end of the 6th century. The photo below shows another baptistry basin, built as a part of the Basilica of Bellator. Far less attractive, it is still noted for its 4 original columns. It is about 200 years older than the one in Basilica of St Vitalis. The surrounding walls are a later addition, when it was converted into a chapel dedicated to Bishop Jucundus. Sbeitla was one of the leading cities of Christianity in this part of the world until the arrival of Islam. Five churches can be identified among the other ruins, but sad to say, most of them offer little but a bit of walls and columns. There is little that takes your imagination and lifts it up. Like the forum can. The Church of St Servus (lower photo) is interesting for being originally Numidian temple. The temple was converted into a baptistry, where after the body of the church and an apse was built around it. Three Christian structures lie after one another to the north of the forum, with Basilica of St Vitalis as the largest (lowest photo). The superb Baptistry basin in its middle, is the finest attraction at this part of the ruins. A tiny bath inside a church? This delightful little mosaic fountain or pool stands in the middle of Basilica of St Vitalis. Considering that all guide books claim that Sbeïtla’s theatre is in a pity shape, I must say that I got a bit surprised. Many parts have been reconstructed into a near-original shape and you can quite easily imagine many of the functions. The lowest part of the stepped seating has been reconstructed, so you may sit down and imagine that a play in Old Latin is staged in front of you with the river and the trees in the back. Most of Sbeitla are dwellings and streets built from inferior material to the temples, baths and theatres, there is usually much to see from this. Reconstruction work has attempted at bringing some quarters to life, where crude sandstone and small hard stones are used for the walls. Almost nowhere does this rise so high that it reaches the roof, but on the photo to the left you see a wall where there even are two tiny windows. The photo here shows quarters of slightly better quality, being the shopping area, with the houses facing the busiest streets. I found hard to identify the fountain function of the public fountains at Sbeïtla. The upper photo shows the most noteworthy, situated not far from the House of the Seasons. The lower photo shows a huge fountain area next to the grand Forum. At least on the last fountain, there are cuts in the front slabs, letting water out before flowing over. But where is the piping? The House of the Seasons is named after a mosaic that is now in Bardo Musuem in Tunis. The house is still worth a bit of exploration. It is noted for its fine colonnade carved with a vine, and has a couple of large and fine colonnaded rooms. Yes, you’re right, this is a result of much reconstruction. Many of the stones may not even have been in the construction originally. The reconstruction has used plans from reservoirs in other Roman cities, and it does give a nice view into water engineering 2,000 years ago. Of this temple in the northern end of the city, we know quite little. But it appears to have been a pre-Christian construction. The Byzantine forts in the southeast of ancient Sbeïtla are not imposing of any kind, and of really small proportions. Yet, they are interesting because so much of the interior has survived into our times. Most of the really large Byzantine fortresses other places in Tunisia have commonly only the outer walls intact. It seems like the 3 fortresses of Sbe?tla served mainly to to protect the elite of the city and defend the city against small groups of intruders. Sbe?tla has the best preserved olive press from Tunisia’s Roman era. Parts of the press itself are in good condition, together with the building. It is really no big surprise that Sbeïtla has been able to provide such a fine olive press, olives were the true foundation of the city and its wealth. The Arch of Diocletian marked the southeastern entrance to the city, and was built late in the 3rd century CE. That makes it, interestingly, almost 150 years younger than the forum. Beyond the arch, the road leading all the way to the ancient city near modern Sfax, leading through the olive tree plains. Really little remains of the Arch of Septimus Severus. It may be suggested that its belongs to the poorer part of town, and may have been built of inferior quality compared to the Arch of Diocletian. The Roman bridge crossing the seasonal river may have served as a aqueduct; there is spring on the other side of the river, which has excellent water quality and is pumped directly to Sfax. The bridge has been extensively restored, and is used even in modern times. The condition of the amphitheatre, as well as its location outside the city walls, indicates that this was a structure for the poorer parts of the population. A similar thing can be seen at Chemtou where the amphitheatre belonged to the part of town where prisoners worked. As Sbeïtla’s amphitheatre goes, there is next to nothing to be seen. The dump in the ground, indicating the scene, is just about visible. As is a couple of the gates. The museum next to the ticket office contains some of the better moveable parts from ancient Sbeïtla. The exhibit has some fine mosaics, a few sculptures, stelae and 5th century altar. The finest artefact here is most probably the statue of a leg-less Bacchus sitting on a panther (second photo). From the mouth of the panther, once a fountain of water came. All in all, the museum is rather on the disappointing side, considering the grand size of Sbeitla altogether. But it does try to illustrate the changes through history, from the Libyan period with its megalithic tombs until the demise of Sbeïtla at Byzantine times. Two hotels in town. One budget, the other mid-range, both offer fair value for money. The best hotel, the Sufetula is undergoing renovations, and will not reopen until long after our last visit in September 2005. A small, but adequate, number of restaurants. Most are also licensed. One hotel in town, that will give the usual services of exchanging foreign currencies and giving cash on your VISA or Master Card. Buses run for Kasserine, Sidi Bou Zid, Tunis, Gafsa and Sfax. 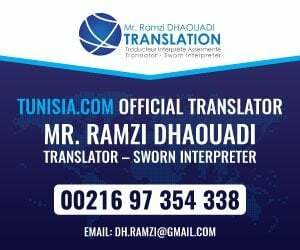 Shared taxis cover only Sidi Bou Zid and Kasserine. The train has no passenger services.